Mutual Weirdness: My Cute Nephews! So my birthday was a couple weeks ago, but I held off on celebrating with my family until this past weekend as they knew they'd be able to come visit then. We didn't do a whole lot other than go out to eat and hang out at my apartment for a while, but that was enough to get some really cute pictures of my nephews! 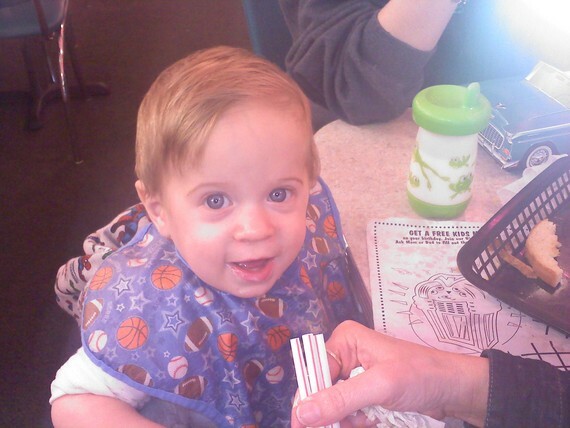 We went out to eat at Cheeburger Cheeburger. Here's a link to their website for those of you who have never heard of them. Diner experience with custom made cheeseburgers! Now because they also do shakes, and have a "shake of the day" we all felt the urge to indulge. Pictured above is my youngest nephew, Ronan, showing off a big grin after Grandma let him have some of her Peanut Butter and Banana shake. This kid has suction power! See those 3 straws in Grandma's hand? Ronan had all three of them in his mouth with shake moving up all three of them at the same time! Now back at the apartment there wasn't much to do, but I do have a Wii and the boys found the controlers. 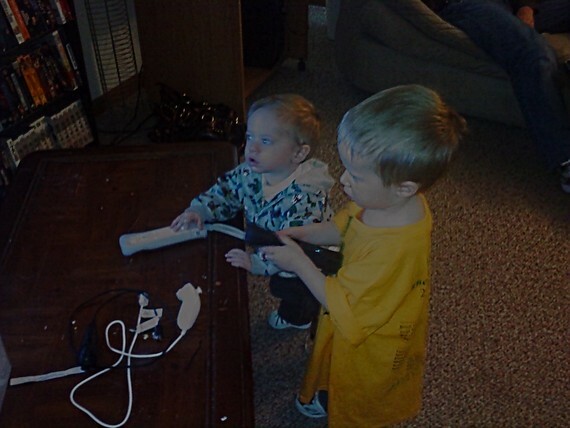 Since both Mom and Grandma have Wii's they know what they are for, and Colin, the older brother, talked us into letting him play. Colin is 2 1/2 years old and is one smart cookie. At the resturant he recited his ABC's song for us a couple of time to great cheers. With the Wii he made sure, when asked, to put on the wrist strap and did his best to follow our instructions on how to play the games. I only have a couple games so he was playing Sport Resort and ended up with the Sword Fighting game. It was the easiest for him cause all he had to do was swing the remote back and forth a lot, lol. I think Colin was better at the game than me. He improved my score by nearly 100 points. Though he had lots of help. The entire time the rest of us were cheering him on with shouts of "Swing faster!" or "Swing bigger!" And he was going to town so much that at one point he hit Ronan in the head! Though he immediately turn and said "sorry" before going back to the game. We tried moving Ronan away from Colin or having Colin move back from the coffee table to prevent this, but it just didn't work. 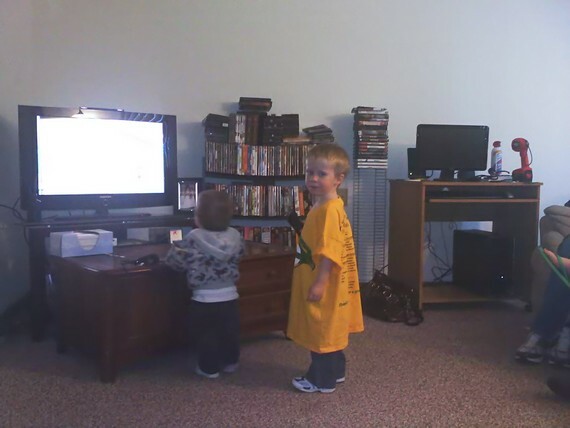 Colin would move back towards the TV and Ronan would move back to stand beside his brother. He just had to be right there in the action! This went on and kept us entertained for several hours. 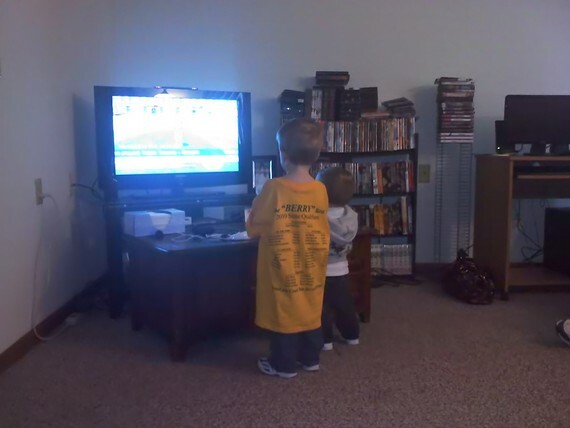 Nothing like 2 adorable little boys to help keep things interesting. I was even able to get Colin's attention for just a brief bit for a smile and a picture.